Like its predecessor, the manual-focus Milvus 2/100M has 9 elements in 8 groups and focuses to a minimum distance of 1.48’ (0.45m) with a magnification of 1:2. To get to 1:1 life-size, however, you’ll need an extension tube. While the optical construction remains unchanged, the new model features an improved T* coating that’s said to be optimized for high-resolution sensors. Besides that and the upgrade to an outer shell that is reminiscent of the Zeiss Otus models, all the Milvus models feature seals for protection from dust and moisture. With a Nikon mount, this ZF.2 model also has a de-click option for the aperture collar. Not only does this allow for step-less setting of the aperture, but also it reduces both noise and vibration during selection — all potentially useful features for video capture. With a 67mm accessory thread, and measuring 4.63 x 3.17” (80.5 x 103mm), the lens is slightly larger than its predecessor and a little heavier at 1.78 lb. (807g). 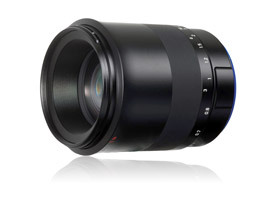 The lens is available now at $1850, the same price as the earlier model. We’ve analyzed the lens on the full-frame 36-Mpix Nikon D810 and are delighted to share the results. Mounted on the full-frame 36-Mpix Nikon D810 body, the new 2/100M (as Zeiss calls it) achieved an overall DxOMark lens score of 40 points. 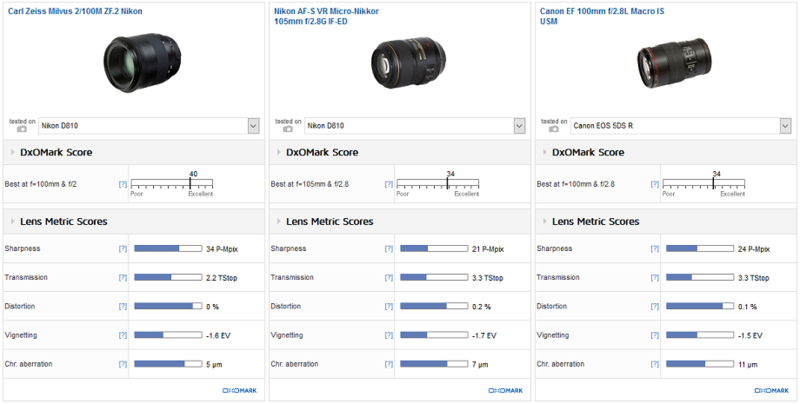 Given the complexity of high-speed macro lenses like this, that’s a high score, and the lens ranks high in our database. The optimum aperture is f/5.6, where the lens reaches close to perfect symmetry and homogenous sharpness across the field. Even when opened up to the initial aperture, the lens performs at a very high level, with high center sharpness and very good peripheral sharpness. Transmission, distortion, and chromatic aberration are all excellent, while vignetting, measured at –1.6EV in the extreme corners, is also well-controlled, given the lens speed. 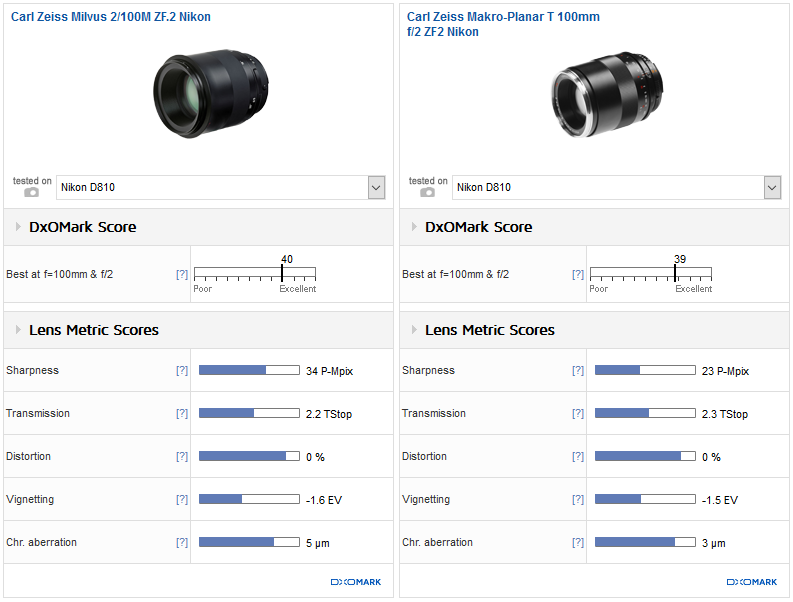 Against its predecessor, the highly-regarded Makro Planar T*, it comes as no real surprise to see that the overall scores and therefore the rankings are close; however, the new model shows a significant increase in its sharpness score. 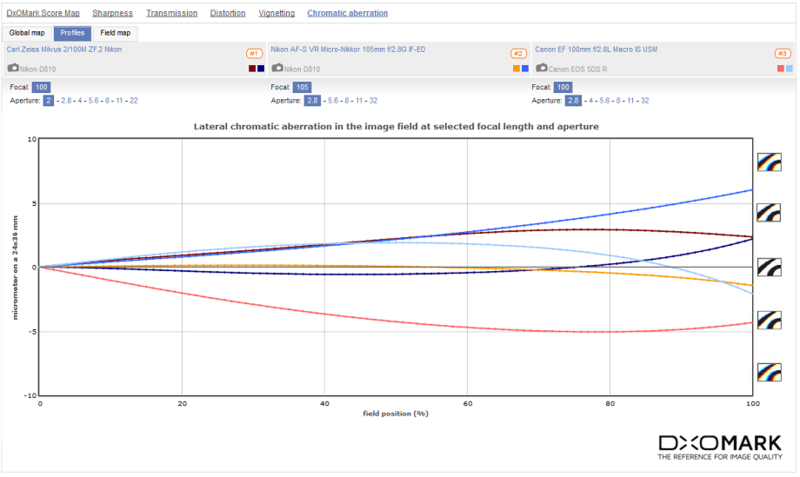 If you look at the acutance profiles, much of this has to do with the improvement in symmetry, or imaging accuracy, between the sagittal and meridional measurements across the image field, where large differences can lead to smearing. 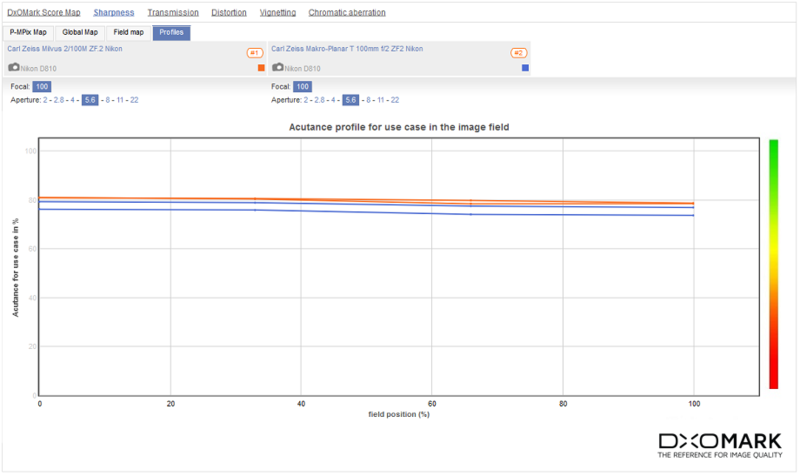 However, the new model also shows some slight increase in outright sharpness (acutance) at just about every aperture setting. As for transmission, distortion, and vignetting, there’s not much difference between them, though the new lens has a slightly more noticeable darkening at the corners, despite the negligible difference in measured values between them. 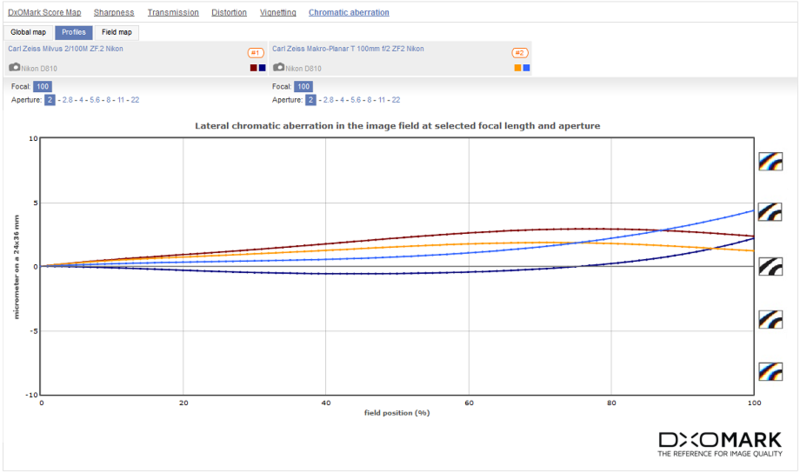 Lateral chromatic aberration profiles also differ noticeably, at least in measured values, with the new model showing low levels but still slightly higher overall than its predecessor. Perhaps not surprisingly, there is no shortage of decent 100mm macro models, though the high speed of the Zeiss commands quite a premium compared to the $890 of the Nikon AF-S 105mm f2.8G. As a plus, though, the Nikkor model has both autofocus and VR and can achieve a maximum magnification of 1:1, making it a true macro lens, albeit with a shortening of the focal length. Introduced in 2006, it is the oldest lens of the three, but still performs well. The $1000 Canon EF100mm f2.8L Macro IS USM has very similar specs, but even on the higher-resolution 50-Mpix Canon EOS 5DS R body, it performs similarly the Nikkor and comes up a little short against the Zeiss. At f/2.8, the Zeiss is as sharp as the Canon and Nikkor models at f/5.6, and even slightly sharper in the center. What’s more, that margin is maintained when stopped down. Given the difference in lens speed, equating to around 1.5 TStops over the Nikkor and Canon, the Zeiss is a formidable performer. 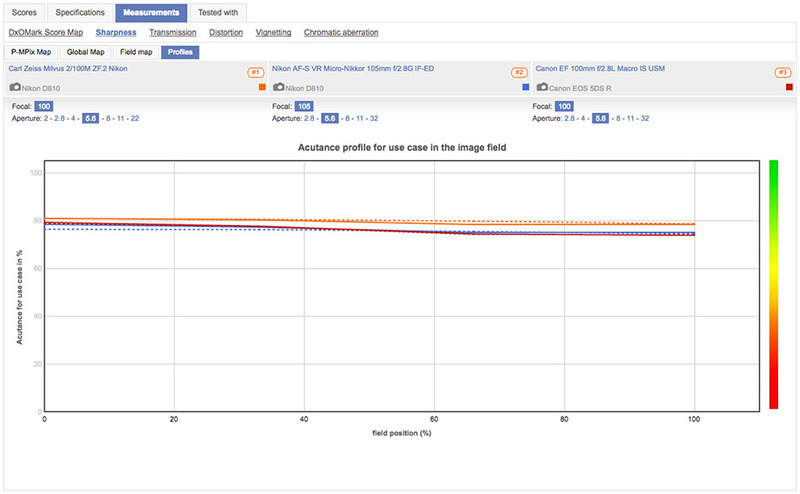 It also has lower vignetting, no distortion, and lower levels of lateral chromatic aberration. Even the newer version of the Canon doesn’t come close in chromatic aberration — in fact, it has higher levels than either of its competitors. Many of the models in the Classic range were based on Zeiss Contax designs, and while excellent, it was inevitable that they would be refreshed to meet the slightly different demands of modern digital SLRs. The original 2/100, however, was a relatively new design and an outstanding optical performer anyway, so any serious updates to the optical design would likely have resulted in a stiff premium. As it stands, the enhancements in the new T* coating have brought both a welcome increase in sharpness levels and in uniformity across the field, all achieved while maintaining the price of the original model. While it’s not exactly cheap, optical quality like this rarely is.